I'm a firm believer in listening to prophetic counsel. In fact, I can think of only one thing more valuable than taking counsel from a prophet and that would be taking counsel from the Lord as He conveys it to us through his prophet. That kind of counsel can be found throughout our Doctrine & Covenants, where the Lord identifies Himself as the one who is speaking. We refer to these communications as oracles or revelations. This type of divine counsel differs from prophetic counsel, because prophetic counsel indicates it is counsel given by a prophet in his own words, rather than conveyed "first person" in the Lord's own words. 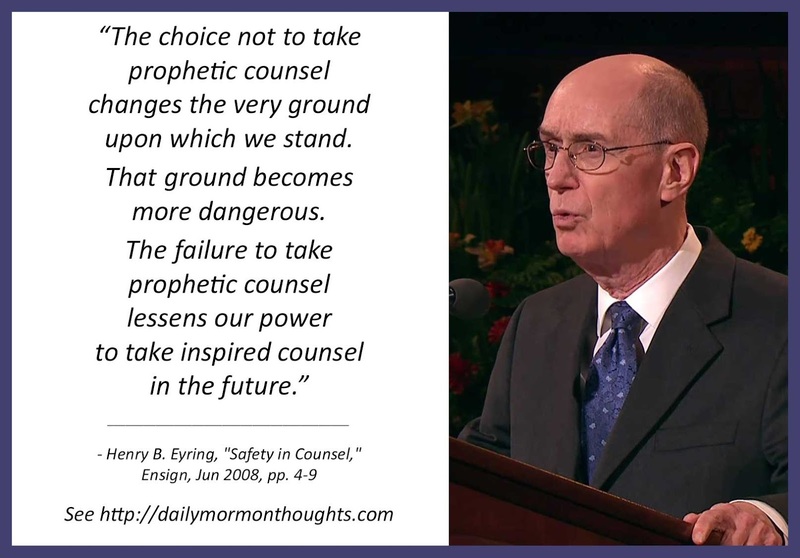 This is not to minimize the importance of Prophetic Counsel, because, as Henry Eyring indicates in the quote above, prophetic counsel is often inspired counsel. The scriptures provide evidence that every true prophet who ever lived was infused with knowledge and wisdom far greater than he had prior to having met Jesus Christ in person. It was this first-hand acquaintance with the Lord that qualified Joseph Smith to speak with increasing wisdom and authority, even in those instances when he was merely expressing his own opinion and not quoting the Lord directly. The angel who visited John the Revelator told John that "the testimony of Jesus is the spirit of prophecy," and we can see that from the time Joseph Smith had his first personal encounter with Jesus (and numerous subsequent encounters), he acquired the spirit of prophecy, which expanded his understanding and gave him added knowledge and wisdom. It would appear, then, that a prophet is defined by his having had a personal encounter with God, an encounter which he is willing to testify of without hesitation. This is important, because it would appear that the defining quality that separates a true prophet from a false one, is that the true prophet is not reluctant to share his personal testimony of Jesus. And by "personal testimony" I don't mean the kind of belief in Jesus most of us have obtained through study and prayer. I mean someone who can testify unequivocally to having met the resurrected Jesus face-to-face. Even long before Jesus was resurrected -or even born into this world- we have the testimonies of prophets from the Old Testament and the Book of Mormon who were defined by their experience of having encountered the Lord in a very personal way. In the April 1997 conference talk accompanying the picture above, Henry Eyring provides the example of Lehi, a man who encountered the yet-unborn Savior on multiple occasions in dreams and visions, and who was instructed by that divine being, first to prophecy of the things he had been shown, and ultimately to take his family far away to safety. Lehi had a testimony of Jesus not because he had read about Him in the scriptures or learned about Him in the synogogue, but because he had encountered the future Messiah in person. This encounter resulted in Lehi's obtaining greater knowledge and wisdom than he had previously, and it qualified him to provide prophetic counsel not only to his family, but to those who joined Lehi's family in their Journey. Likewise, Lehi's son, Nephi, strove to obtain a testimony of Christ, as did many who came after Nephi. Again and again in the Book of Mormon, those prophets who taught us things they felt were important for us to know in our day are known to us as prophets; not merely because they wrote down the history of their people, but because they had a testimony of a personal encounter with Jesus -often many encounters. Each of these prophets spoke from the dust as one having authority; authority that was obtained not because other men laid their hands on their heads and gave it to them. This was authority that could only be given directly from Jesus Christ. The prophet Joseph declared that all the prophets were ordained by God Himself (TPJS pg 181). This is not some invisible "authority" that can be handed down from one man or group of men to another. The original twelve apostles had known Jesus personally; it was He who ordained them and sent them out to preach His gospel after His resurrection. These prophets would travel to distant cities, make converts, and then move on. Their role was not as leaders of the churches they established, but they did often write back with letters of advice to those converts. 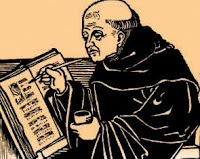 Those letters -at least the ones that survived- contain very little in the way of direct revelation from the mouth of God. But because they had known Jesus personally (and presumably continued to be visited by Him), these men were qualified to provide prophetic counsel in their own voices, counsel that was valid precisely because they were personal witnesses of Jesus Christ. We continue to embrace their prophetic counsel as useful because of the wisdom these men obtained through their proximity to the Lord. Biblical scholars are divided on the question of whether Paul actually wrote those words. A minority have suggested that Paul, a former Pharisee, was still influenced by Old Testament law, but that theory doesn't wash because there is no place in the Old Testament requiring women to keep their traps shut in church. There was a rabbinical tradition that women were not allowed to speak in the synagogue, and while Paul was steeped in Rabinnical tradition, those who believe he held onto those traditions from his past tend to ignore what he wrote to the Galatians where he rejected the Rabbinical prayer that made distinctions between Jew and Gentile, bond and free, male and female; as Paul now recognized all are one in Christ Jesus. "Shut yer festerin' yaps, ya lousy dames!" Regarding this talk of Henry Eyring's under discussion here, I came across it while thumbing through a back issue of the Ensign Magazine dated June of 2008 where it was presented as the First Presidency Message. I stopped to read it because I'm intrigued by how often this term "prophetic counsel" has been carelessly bandied about in the church in the past couple of decades. It seems to be a neologism that grew legs fairly recently, because I don't think it was commonly used in the Church while I was growing up, at least as far as I can recall. I do, however, think it's a useful term, especially to describe the counsel given by Joseph Smith during those times when he was volunteering his personal views. It's known that Joseph Smith delivered somewhere in the neighborhood of two hundred and fifty sermons during his brief lifetime, but only fifty are known to have been recorded by scribes. Some of these existing sermons are available in the Documentary History of the Church, and it is from that source that the several snippets of useful counsel have been gathered into the one volume Teachings of the Prophet Joseph Smith. In my opinion it's permissible to call some of these excerpts "prophetic counsel," not necessarily because these snippets contain actual prophecies, but because they contain the wise counsel from a man we know to have been a prophet. The talk by Henry Eyring in that edition of the Ensign was originally delivered during April conference 1997, and Eyring had me agreeing with him for quite awhile as I read it. He spoke of the importance of heeding prophetic counsel, and even spoke of such counsel coming from the Lord's "authorized servants," an important qualifier if there ever was one. If we are going to abide by prophetic counsel, we had better make darn certain those teachings come from someone we have evidence was authorized by God to be His mouthpiece. Otherwise that counsel could be injurious to the church. Sadly, though Eyring writes early in his piece on the importance of heeding prophetic counsel from authorized servants, later in the piece he undercuts his own argument. But I'll get to that in a moment. First I want to mention an important example Brother Eyring uses that I wholeheartedly I agree with. "Up to this day God had given me wisdom to save the people who took counsel. None had ever been killed who abode by my counsel. At Hauns' Mill the brethren went contrary to my counsel; if they had not, their lives would have been spared." Note that Joseph stated that God had given him the wisdom to save the people who took counsel. Joseph was not acting on a personal whim; Even when not dictating a warning directly in the name and voice of the Lord as he did when conveying revelations, Joseph was given the gift of wisdom; a gift he received precisely because his encounters with the Lord had enabled him to cultivate such gifts. He did not boast of his own wisdom; he knew from where that inspiration came. Who Are The Lord's Authorized Servants? I would submit that all who choose to serve the Lord can be called "the Lord's servants," but when Henry Eyring makes reference to the Lord's authorized servants, he seems at first to be referring to actual prophets of the Lord -men who had been specially anointed by God. Of course, a cynic might say, "well, of course that revelation would endorse Joseph Smith; Joseph was the one dictating the revelation. He could say anything about himself he wanted to." That's why we are instructed not to take Joseph Smith's word at face value. The Saints were never instructed to "follow the prophet" without questioning anything he told them. It's a modern heresy to teach that the prophet is incapable of leading the church astray, a heresy that is becoming more and more transparent as the leaders strive ever harder to promote it. But it is not doctrinal. Nowhere in any revelation or scripture in the standard works can you find the Lord suggesting anything remotely close to it. Indeed, the scriptures are chock full of examples that teach the exact opposite. The Lord has never offered such a blanket assurance regarding any prophet in history, not even Joseph Smith. What we are in fact supposed to do (and it's something almost no one in the Church bothers with anymore) is read every revelation God gave to His prophet, then take it to the Lord in prayer and ask God, "Is this yours? Did this come from you?" Even though no one in the church is infallible, there are a multitude of places in the Doctrine & Covenants where the Lord endorses Joseph Smith to be His prophet, seer, and revelator, but that endorsement was conditional upon Joseph's walking in all holiness before Him, in all patience and faith. (D&C 21:4&5) If Joseph failed in his appointment, the Lord could pull those gifts right out from under him. Nevertheless, the Lord still expects us to ask Him about the legitimacy of each and every revelation given through anyone who purports to be His servant. We are not to take any claim at face value. That doesn't mince words. Joseph was the chosen one, but he could be replaced if he messed up. The Lord recognized that even Joseph Smith was capable of leading the church astray. That reality differs markedly from the smug assertions of Church leaders in our day, who constantly assure the members they are incapable of failure. That latter part is interesting for several reasons. First, this is not about "following prophetic counsel" as we've been discussing up to this point. When it comes to the actual doctrines of the church, we are not to rely on the prophet's personal thoughts, opinions, expressions, or whims. The Lord is talking here about His words and commandments, not some arbitrary rules or policy changes announced by the president of the church. That's why the Lord is very specific about that qualifying phrase: only the words and commandments Joseph gives unto the people that he receives directly from God are the words the members are to consider binding upon them. In other words, we have never been commanded to "follow the prophet." We are commanded to follow those words Joseph Smith received that can rightly be considered "as if from [God's] own mouth." And there's one further detail. Notice the Lord doesn't tell us we are obligated to obey the words the Lord puts in Joseph's mouth. We aren't even commanded to "follow" the prophet. We are to heed the words and commandments. To "heed" means "to consider; to give careful attention to." In other words, we are to pay careful attention to any purported revelation, then consider whether these words came from the mouth of God, while carefully praying for a witness that they are indeed God's words and commandments, and not just the wisdom of Joseph Smith. Since we are to do that regarding the revelations that came through Joseph Smith, it should go without saying that we ought to give the same prayerful consideration to anything said by anyone purporting to be God's Authorized Servant in our day. 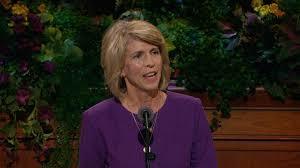 Have you ever watched someone tell an outright lie over the pulpit? You haven't? Then you don't spend much time watching general conference, do you? "Concerning the living prophet, the Lord commands the people of His Church: 'Thou shalt give heed unto all his words and commandments which he shall give unto you as he receiveth them, walking in all holiness before me.' "
Whoa! Wait a minute, what was that? Open up your D&C to section 21 and see who it was the Lord was saying those words concerning. Was he saying that about "the living prophet" Thomas Monson, or was he saying it about the long-since departed Joseph Smith? Where is the revelation from God indicating His choice of Thomas Monson to be the current prophet, seer, and revelator? We have nothing at all from the Lord endorsing Thomas Monson as His prophet, living or otherwise. Don't you think Thomas Monson's appointment by God as His mouthpiece on the earth would be important enough that every member of the Church could recite that revelation by heart? We can't find any evidence that Thomas S. Monson was ever anointed, appointed, ordained, called, or simply set apart by the Lord to any office whatsoever, and yet here we have a woman who is willing to blatantly lie about the the very words that came out of God's mouth, all in order to convince those in the congregation gullible enough, or simply unacquainted with scripture enough, to buy into her load of baloney. "In a world threatened by a famine of righteousness and spiritual starvation, we have been commanded to sustain the prophet." Really, Carol? Commanded to sustain which prophet? Joseph Smith? And when did the Lord command us to do that? I'd be happy to sustain Joseph Smith, but I'm not aware of any commandment requiring anyone to do so. To my knowledge no one in the church has ever been commanded to sustain Joseph Smith, or any other prophet, ever. Now you're not just lying about what the scriptures say, Carol McConkie, you're making up new commandments out of thin air and insisting they came from God. 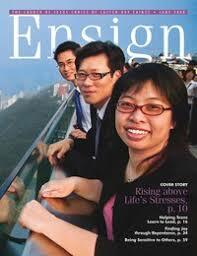 Are you saying we are commanded by God to sustain Thomas Monson? Okay, fine. May we please see that commandment in writing so members of the church can do their duty by taking it before the Lord for a witness that it did indeed come from Him, and not from the fevered brain of a middle-aged, idol-worshiping Meschugena? Maybe some women should keep silent in church. I'm sure I don't have to tell you that particular scripture verse has no application whatsoever to President Monson's counselors and the Quorum of the Twelve Apostles. That revelation was directed at four specific elders regarding a specific ministry at a specific time; and although verse 2 (which Sister McConkie failed to quote) states that it could have application to others "whose mission is appointed to them to go forth," neither the First Presidency nor any of the Twelve apostles bother to "go forth" anymore these days as their offices require them to. Instead, they stay close to the corporate boardroom so they can direct the financial affairs of the Church without leaving their comfy headquarters in Salt Lake City. When was the last time you saw a member of the First Presidency or the Quorum of the Twelve Apostles moved upon by the Holy Ghost? You'll forgive me for belaboring the obvious, but reading a talk from a teleprompter that was prepared weeks earlier by staff writers does not equate with being moved upon by the Holy Ghost. Sister McConkie's talk was a shameful display of propaganda, aimed at an audience she hoped would be ignorant of the scriptures she was deliberately mangling. But she is not the first to do so, and she won't be the last. Two other speakers in that very conference session lied from the pulpit just like Carol did, but I won't bother to list those sins at this sitting. 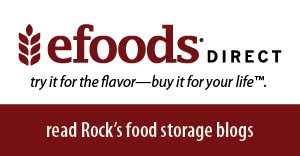 You can find an accurate summary by Matt Lohmeier by clicking here. "The Lord has said of them." The Lord has said of them?! Anyone who reads that revelation in its entirety knows the Lord said no such thing about those who were sitting in the chief seats in 2010. His words were directed at a specific, small group of men who compiled the Book of Commandments years before Henry Eyring and his friends were born. And no one besides those particular servants, as would be obvious to anyone reading the entire revelation. I think we've established that in order for anyone's words to qualify as "prophetic counsel," the speaker of those words must be shown to be a bona fide prophet. And I think we have established that Joseph Smith qualifies, because not only can we find numerous instances where the Lord has affirmed his divine calling, but Joseph Smith published evidence in the form of revelations that can be readily produced for examination. But despite my digressions, this essay is not about revelations; it is about prophetic counsel. Or put another way, at this time we are examining statements of a prophet that come from the prophet's own mind, rather from the mouth of the Lord. So let's take a look at three or four examples of prophetic counsel given by our founding prophet, and then take a quick look at whether or not Henry Eyring and his pals in the Church hierarchy have been taking that counsel to heart. Today there are no oracles in the LDS Church -the very Church making the claim that the entire bunch at the top of the Church hierarchy receive revelations all the time. You're not supposed to ask why we haven't seen or heard any of those oracles, because asking that question is considered ill-mannered. To get around this absence of oracles in the church today, the Church lesson manuals now teach that the president of the Church and his counselors are themselves oracles. God talked about oracles several times, but it was pretty clear he was not referring to human beings when he used that term, and neither was Joseph Smith when he spoke about oracles. What I find glaringly obvious about these so-called "living oracles" is that none of them have managed to generate as much as one revelation that has been placed before the congregation for a sustaining vote in over a hundred and fifty years. You'll excuse me for saying so, but that makes their boast about being either "living" prophets or "living" oracles ring a bit hollow. 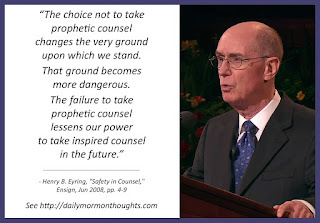 The Twelve apostles today completely ignore that prophetic counsel, and that includes Henry Eyring, who spent a great deal of effort warning about the dangers we face when choosing not to take prophetic counsel. He's right, of course. The Twelve's failure to take prophetic counsel provided to them by Joseph Smith has changed the very ground upon which they stand, as every week more and more members of the Church recognize these guys cannot follow through with the promises they have been making. The Twelve apostles, who previously were strictly prohibited from having any managerial or administrative function in the Church, have become, in modern times, the top governing body at the very top of the hierarchy. But to get there, they had to disobey direct commandments God made in D&C 104. Their choices to ignore prophetic counsel have had consequences, as convert baptisms are nearly at a standstill and believing members are walking away from the Church in massive numbers. The ground is changing, indeed. As Eyring himself foretold, the ground he and his cohorts have been standing on is becoming more dangerous to them as the saints discover that the claims of the modern Church leaders are empty boasts. “the patriarchal office is the highest office in the church. And Father Smith conferred this office on Hyrum Smith on his deathbed.” -Joseph Smith, May 27th, 1843 in meeting with Hyrum Smith, James Adams, Newell K. Whitney, and others. Reposed in the LDS Archives but found in D. Michael Quinn’s The Mormon Hierarchy: Origins of Power, pg. 306, footnote 70. This is another instance where modern leaders of the Church opted to ignore the prophetic counsel of Joseph Smith and do things their way to ensure they would remain top dogs in the corporate structure. The Presiding Patriarch is denominated as a prophet, seer, and revelator in D&C section 124. Yet in 1979, absent a revelation from God, and without consulting the church membership for a vote, the First Presidency and Twelve Apostles forced the presiding patriarch into an early retirement and quietly abolished the highest office in the church. This travesty is documented at length in "Brigham Young's Hostile Takeover." The Church cannot operate under the government established by Jesus Christ so long as members of the current government were willing to give the boot to the one person holding the only legitimate office that remained. I'd sure like to read the revelation Elder Ballard got that from. 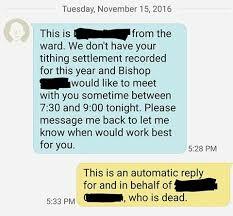 This alarming change in emphasis is indication of nearly a hundred and seventy years of progress in this church simply abandoned to the wind, converting the once promising Church of Jesus Christ of Latter-day Saints into just another anemic cult. You're probably familiar with the saying, "extraordinary claims require extraordinary evidence," but I don't think that holds true among those of us who already believe in the gospel of the Restoration. We are already convinced of the truthfulness of the gospel, the Book of Mormon, and the core fundamentals of Mormonism. Prominent members of the Church such as Thomas Monson, Henry Eyring, Russell Ballard, Russell Nelson, Carol McConkie, and others have made extraordinary claims, but I think it would take only an ordinary bit of evidence if they wanted to be proven correct. The men at the top of the chain in the Church claim to be prophets, seers, and revelators, in the same manner Joseph Smith was, with all the same gifts, authority, and "keys" the Lord gave to the prophet Joseph, and because they hold that authority they insist that the rest of us follow them without question. We don't need them to show us any extraordinary evidence to back up their claims of being prophets, seers, and revelators. All they need to do is produce one or two actual revelations from the mouth of God, so those of us who believe in continuous revelation can take those revelations to the Lord for confirmation. That's all. Just produce a couple of simple pieces of evidence for us to examine, and if it turns out the Lord is truly directing your efforts, we will stop speaking out against you. But if you fail to comply with that reasonable request, there may be no alternative for the rest of us than to follow the Prophetic Counsel of Joseph Smith and set you down as imposters, and cut you off from among us as dangerous and useless branches. Did The Lord Choose Not To Anoint 'The Lord's Anointed'? 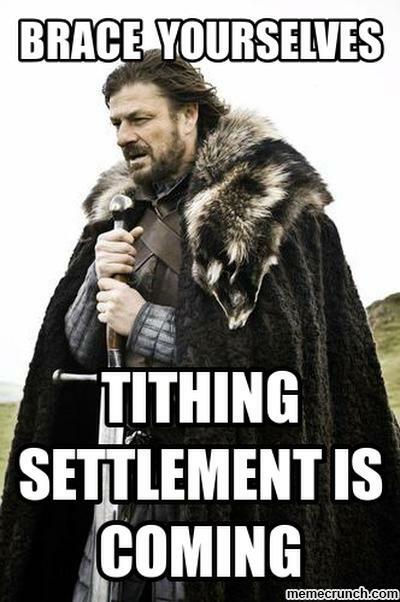 Well, that joyful season is upon us once again, and the Church wants to make sure you don't miss out! I'm not referring to the season when we celebrate the birth of Christ. (Let's not confuse Church priorities here.) 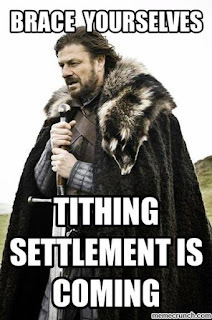 I'm referring to the season when you get guilted by your bishop into coughing up extra money so it can help pay the bloated salaries of those top Church leaders who already make more money than you do. Facebook, as it is wont to do now and then, today showed me a reminder of a blog post I wrote three years ago. Seeing as how this blog has picked up thousands of new readers since then who may have missed it, I thought it appropriate at this sacred time of year for this thing to be seen by those who may not have seen it on its first go-round. Even if you have read it before, I think it's worth a second look. This particular piece happens to be one of my favorites, not least because it was cited at my court of excommunication as one of the four blog posts that cost me my membership in the church. Seeing as how nothing in the post was admitted to either be in error or damaging to anyone's testimony of the gospel, you might like to try guessing what harm those in control thought it could possibly do to the Church. Click on the link below. And don't forget to share it with your friends!